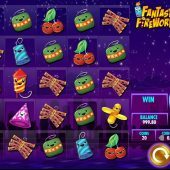 Fantastic Fireworks slot is a rare IGT incursion into the world of cascade games with block pays such as Gemix, Viking Runecraft and Aloha! Cluster Pays. Unfortunately we get anything but 'fireworks' in the main here with pretty basic graphics and an overly complex set of rules for what could have been decent slot. For some reason the fireworks here have been given inane smiley faces and even the sounds are juvenile when they could have been far more powerful as is the case with Netent's Wild Rockets. We can only hope that our bankroll won't go up in smoke as quick as my hopes when I saw this game. Don't ask me why, but IGT have made the cascades rise from the bottom of the 5x5 grid instead of falling from above. Maybe it's because fireworks tend to explode upwards but whichever it's immediately annoying to the player although the transparent icons look good over the starry night sky in the background, well as good as these childish ones can. You pay 20 coins a spin and can have a vertical or horizontal line of 3, 4 or 5 anywhere on the grid to win. Now naturally these can form a 'T' or a cross so we have events based upon those type of configurations. The pays are low; Rockets, Blues, Cherries (why?) Firecrackers, Volcanoes and a yellow and a green object of undecipherable appearance all pay 50 coins (2.5x bet) for 5-of-a-kind, 10 for 4OAK and 4 for 3OAK. You can get a Catherine Wheel Wild in any position which is just that - a Wild. A 'boom' Rocket is created on the 2nd position of any 4OAK win and a Criss Cross Blue symbol in the centre of any cross formed by intersecting 3OAK wins. If you see a 5OAK win a Super Symbol is created. Some icons can be overlaid with Sparklers which add to the Rocket Bonus Meter on the right of the reels when they occur. This meter will fill instantly if a 'Bonus' symbol appears anywhere on the grid. Got all that? These Special Symbols explode when they are part of a winning line or when they are hit by another Special because they move around the grid each spin until they are used. The Criss Cross will explode all symbols in their row and column to explode. The Super Symbol will explode all of the most numerous symbol on the grid. As said, these Specials will remain on the grid, mobile, until they are used. They may even multiply on the next spin to result in many moving about simultaneously. They actually award a cash value for each explosion on the same cascade, the first paying 20 coins or 1x bet and the seventh or beyond 10x bet. Right, that's the simple bit out of the way ha ha! So, you've collected 20 sparklers or one Rocket symbol to fill the meter. You will get one of two features chosen for you and yet again we get the stupid cash award one as well as the chance of free games. Cannon bonus - select three of six stupid grinning Firework Cannon Launchers for three small cash prizes to be aggregated. Whoopee. Free spins - you get 8 free games with a random amount of Specials on each spin. 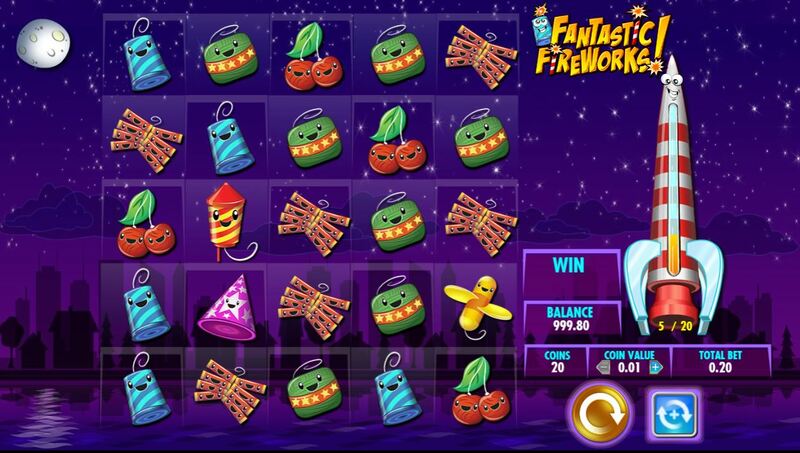 You can earn 4 extra spins for 10 sparkler overlays, no limit. Explosive action, thrilling - but at least marginally better than the Cannon Bonus.